Browse: Home » 2006 » June » Lego robots! I’ve always loved robots. I remember those little Heathkit HERO robots from when I was a kid. They were so cool! And of course I love the robots of Survival Research Labs! The announcement from Microsoft’s Robotics Group about their “Robotics Studio” got me pretty excited to do some playing with robots in the near future. As I was digging around I found an announcement for Robot C, a “cross-platform software language for programming robots.” It’s in Beta, and it looks a lot like C. And hey, it supports Lego Mindstorms RCX and NXT. Wait, what’s NXT? 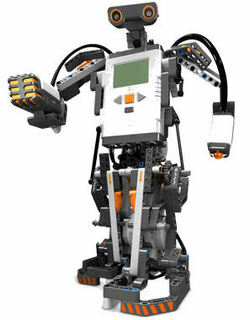 Mindstorms NXT is aawwwwesome! It’s not out until Fall 2006 though. But how cool is that? It comes with a 32-bit microprocessor, touch sensor, sound sensor, light sensor, sonar, and servos. There are loads of example projects already on the site. And someone on there was using this cool LDraw CAD software to model their robot before building it. So many cool toys!